 Easy to Play: Has two motivation options, forward and reverse, turn left/right, 360 degree rotating and stop with brake lights, the special vacuum feature allows the car to drive vertically or climb walls, auto shut-off helps conserve battery life. 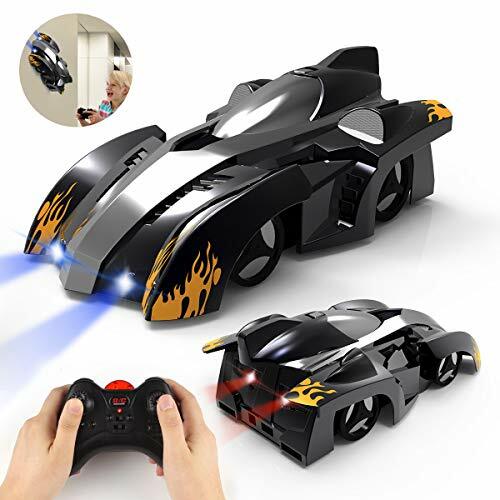 Not only can it be used as a wall climbing car, but also a regular remote car.  Firm Structure : Made of high-quality materials, strong collision resistant. Adopted new materials, durable and strong shockproof car body, can reduce the damage of falling by accident and prolong the service time. The Mini RC Car has a lightweight heavy duty body that won\'t break even if it falls from the ceiling or wall. Indoor & Outdoor Fun: The ultra lightweight car body is coupled with a powerful suction fan, can drive anywhere! Floors or walls, up and down! please do not drive it on hollow, non-planar, the track must be smooth or glassy,Glides perfectly on any smooth surface both indoors & outdoors, such as walls, floors, windows, glass, even ceilings. Funny time everywhere!  Cool Gadgets & Funny Gifts : The advantages of firm structure, good stability, high machining accuracy, long service, super cool shape and lightweight body, it can enhance your operating ability greatly, and meanwhile superb light and sound effects will bring you a lot of surprise and fun. It\'s really a great gift for your beloved one and the best gift for racing enthusiasts. Quality Guarantee : The cool and stylish stunt car body is made of premium long lasting ABS plastic ensuring resistance from impact. And with exceptional service, we provide 30-day hassle free return policy.